This vegan apple crisp is a favorite for casual family dinners as well as the holidays because it is not only dairy-free and egg-free, but it's also super easy to prepare. For quicker weeknight preparation, you can leave the skins on the apples, but this recipe truly benefits from peeling them first. In muffin tins: Cooking this vegan apple crisp in muffin tins will cut the cooking time and create perfectly portioned desserts for breakfast or a post-dinner dessert. In ramekins: This recipe should make enough for 6-8 standard-sized ramekins which will also cut down on cook time and allow for a cleaner and easier way to cook and serve in the same dish which makes for better presentation as apple crisp can be messy when transferring from baking pan to plate. In coffee mugs: Serving apple crisps in coffee or latte mugs not only cuts down on cook time but again allows for easy serving. In martini glasses: A cocktail party isn't complete without martini glasses, but drinks aren't the only thing that can be displayed in these decorative glasses. Fill them with the apple crisp and top with cocktail cherries on top of a dollop of whipped cream. In parfaits: Take your apple crisp to another level by serving it in layers with vanilla ice cream in a parfait-style dessert. 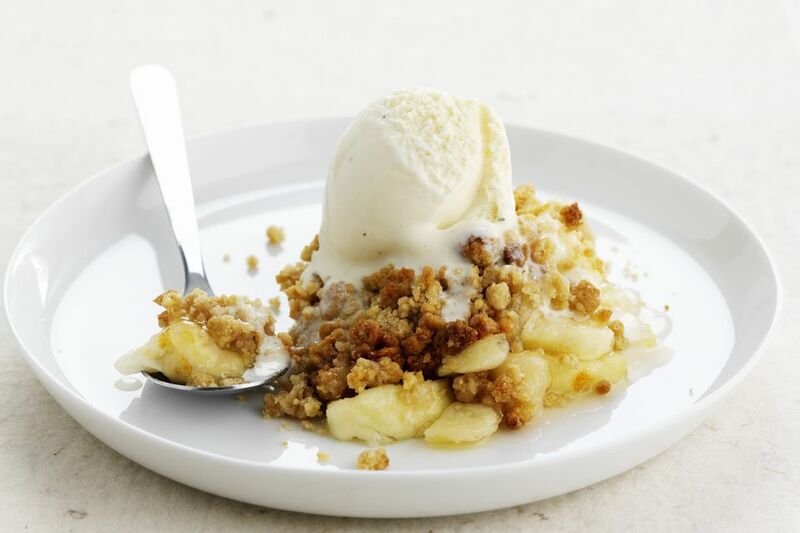 This method can also help you stretch the apple crisp mixture and incorporate other add-ins. Makes one 9 inch x 13 inch crisp. Pre-heat the oven to 350 F. Lightly oil or grease a 9 inch x 13 inch baking dish, or, alternatively, smaller baking dishes for individual crisps. Set aside. Make the filling. In a medium-large mixing bowl, toss the apple slices with the sugar, ​cornstarch, cinnamon, nutmeg, water, and lemon juice until evenly coated. Pour into the prepared baking dish. Make the topping. In a medium mixing bowl, sift together the oats, flour, sugars, chopped pecans, baking powder, and baking soda until well-combined. Add the melted soy margarine, mixing until the mixture is consistent. Using your hands, crumble the mixture over the apple mixture. Bake for 45 minutes to 1 hour, or until golden brown. Serve warm or cold, with dairy-free vanilla ice cream if desired.